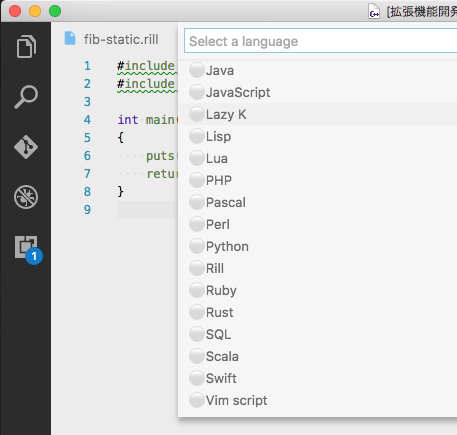 Visual Studio Code>Other>wandbox-vscodeNew to Visual Studio Code? Get it now. Wandbox(GitHub) is a social compilation service. 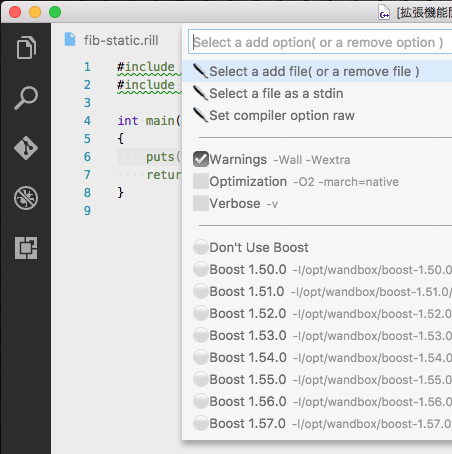 This extension is Wandbox front-end for Visual Studio Code. 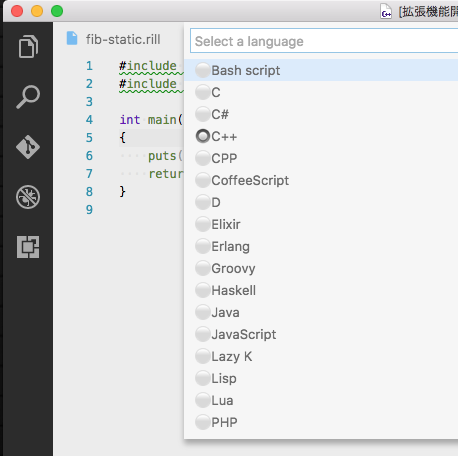 wandbox-vscode provide several commands in the Command Palette for compile, run, share. You can show Command Palette by keyboard-shortcuts. Launch VS Code Quick Open(Mac:Command+P, Windows and Linux: Ctrl+P), Type ext install wandbox-vscode and press Enter and click Install. Restart VS Code when installation is completed. Launch Command Palette(Mac:F1 or Shift+Command+P, Windows and Linux: F1 or Shift+Ctrl+P), Execute Wandbox: New command and select a "Hello, World!" code as you like.  You can also open files in other ways. Launch Command Palette again, Execute Wandbox: Run command. Execute Wandbox: Share command from Command Palette.  You can disable to auto open share url by wandbox.autoOpenShareUrl setting. Execute Wandbox: History command from Command Palette.  You can change max history size by wandbox.maxHistorySize setting. 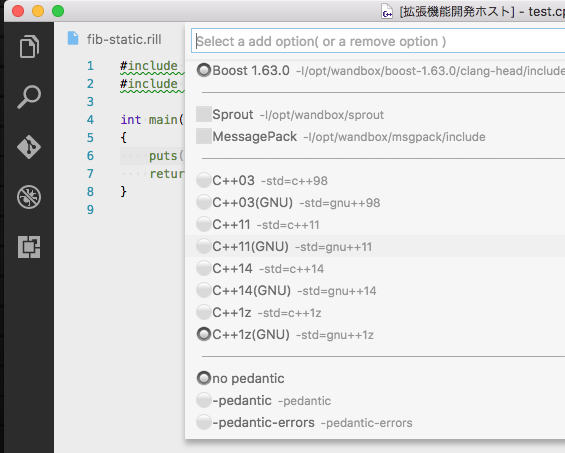 You can change compiler by Wandbox: Set Compiler command. And you can specify various options by Wandbox: Set Options command. 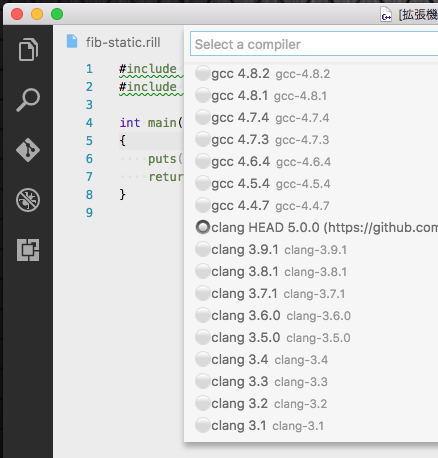  Option repertory depends a selected compiler. You can change settings by settings.json. And you can apply keyboard shortcuts by keybindings.json. Wandbox: New : open new "Hello, World!" 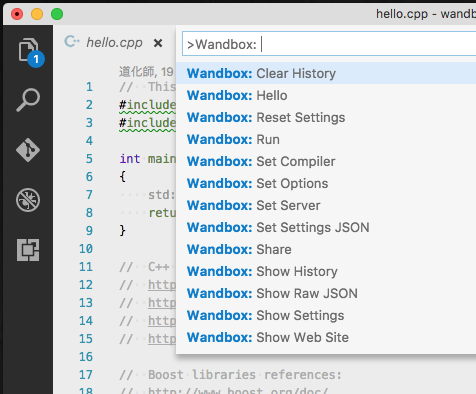 Wandbox: Hello : open new "Hello, World!" ⚠️ Because the Wandbox corresponds to the same function, the [ho Since Wandbox was compatible with the same function,Wandbox: Newis made. And thisWandbox: Hello` command is deprecated now.  You can change to max history size by wandbox.maxHistorySize setting. Target of all setting commands is a current document. Effect of all setting commands expires with next Visual Studio Code process.  You can use https://wandbox.fetus.jp/ . This Wandbox server has a wide variety of PHP compilers. This Wandbox server is provided from @fetus-hina as a personal voluntary service. For keep this service, please do not put a high load on this service.  You can set following if your environment's font is poor. In default, wandbox-vscode's commands doesn't apply keyboard shortcuts. Althogh, you can apply keyboard shortcuts by keybindings.json ( Mac: Code -> Preferences -> Keyboard Shortcuts, Windows / Linux: File -> Preferences -> Keyboard Shortcuts). Command name on keybindings.json is diffarent from on Command Pallete. See below table. ⚠️ Command name like as extention. * is deprecated. "Wandbox has not my favorite compiler!" No probrem! You can pull request to wandbox! Thanks @melpon(  dog) and @kikairoya(  bull) for awesome compilation service! Thanks @fetus-hina(  baby) for a PHP specialized wandbox service! Thanks @rhysd(  dog) for your support in TypeScript! Thanks @chomado(  girl) for a great extension icon!